Intraoperative visualization of liver vessels and tumor margins is an important tool during minimal invasive liver surgery. Aim of this study was to evaluate a high field open MR for intraoperative real time imaging as an alternative to laparoscopic ultrasound. 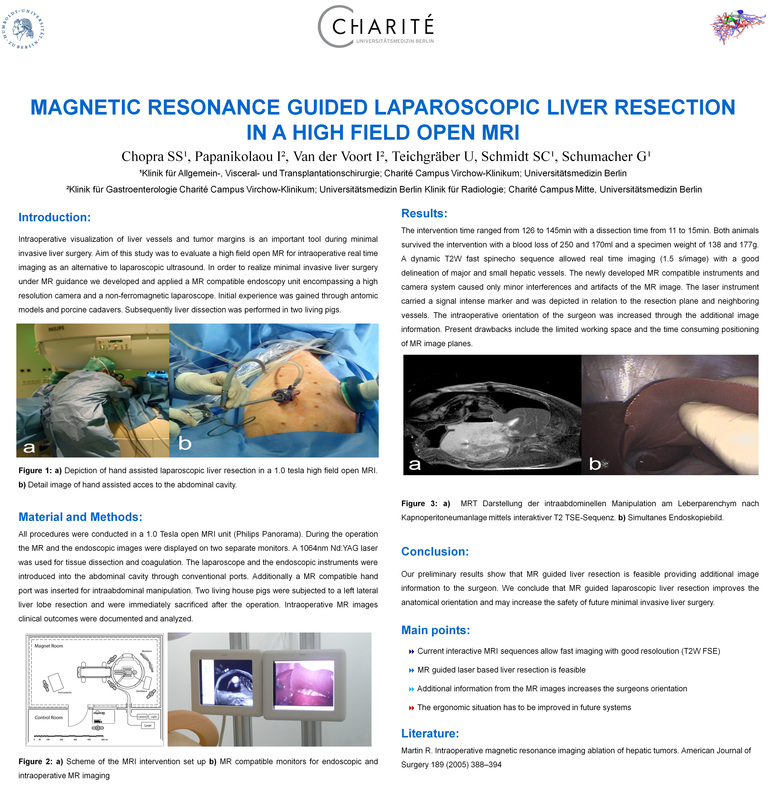 In order to realize minimal invasive liver surgery under MR guidance we developed and applied a MR compatible endoscopy unit encompassing a high resolution camera and a non-ferromagnetic laparoscope. Initial experience was gained through phantom models and porcine cadavers. Subsequently liver dissection was performed in two living house pigs. All procedures were conducted in a 1.0 Tesla open MRI unit (Philips Panorama). During the operation the MR and the endoscopic images were displayed on two separate monitors. A 1064nm Nd:YAG laser was used for tissue dissection and coagulation. The laparoscope and the endoscopic instruments were introduced into the abdominal cavity through conventional ports. Additionally a MR compatible hand port was inserted for intraabdominal manipulation. Two living house pigs were subjected to a left lateral liver lobe resection and were immediately sacrificed after the operation. Intraoperative MR images clinical outcomes were documented and analyzed. The total duration of the intervention ranged from 126 to 145min with a dissection time from 11 to 15min. Both animals survived the intervention with a blood loss of 250 and 170ml and a specimen weight of 138 and 177g. A dynamic T2W fast spinecho sequence allowed real time imaging (1.5 images/s) with a good delineation of major and small hepatic vessels. The newly developed MR compatible instruments and camera system caused only minor interferences and artifacts of the MR image. The laser instrument carried a signal intense marker and was depicted in relation to the resection plane and neighboring vessels. The intraoperative orientation of the surgeon was increased through the additional image information. Present drawbacks include the limited working space and the time consuming positioning of MR image planes. Our preliminary results show that MR guided liver resection is feasible providing additional image information to the surgeon. We conclude that MR guided laparoscopic liver resection improves the anatomical orientation and may increase the safety of future minimal invasive liver surgery.